Book: Empty Mansions by Bill Dedman and Paul Clark Newell, Jr.
Goodreads Summary: When Pulitzer Prize–winning journalist Bill Dedman noticed in 2009 a grand home for sale, unoccupied for nearly sixty years, he stumbled through a surprising portal into American history. 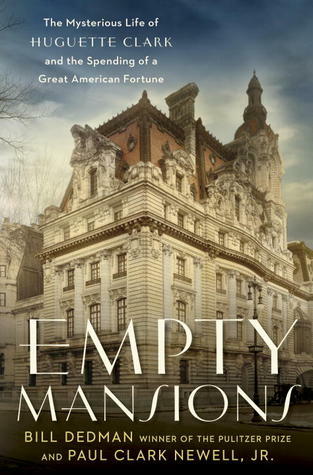 Empty Mansions is a rich mystery of wealth and loss, connecting the Gilded Age opulence of the nineteenth century with a twenty-first-century battle over a $300 million inheritance. At its heart is a reclusive heiress named Huguette Clark, a woman so secretive that, at the time of her death at age 104, no new photograph of her had been seen in decades. Though she owned palatial homes in California, New York, and Connecticut, why had she lived for twenty years in a simple hospital room, despite being in excellent health? Why were her valuables being sold off? Was she in control of her fortune, or controlled by those managing her money? When I saw Empty Mansions on netgalley, I knew I had to request it! While it sounded interested, it was far more interesting than I ever could have imagined. Huguette was such an interesting and eccentric woman, and she really came to life in Empty Mansions. The book does jump around in terms of time and place, but I didn’t mind it, because it gave a really good picture of who Huguette was as a person, and why maintaining mansions that she never visited or hadn’t visited in decades was something she did. Her love of painting and her interest in art was one of the most interesting things about her. And the fact that her relatives hadn’t seen her since the 1950’s and 1960’s was also super-interesting. I can’t imagine only communicating with someone by mail or over the phone…and not knowing that she was living in a hospital room for something like 20 years or that she had cancer. Like, she just randomly gave away millions of dollars. She was very giving- if someone mentioned a child or grandchild going to grad school or needing work done at home, she’d write a check with no hesitation. She lived a very long life, and given she lived to be over a hundred, she seemed to be in pretty good health and pretty alert. And she didn’t write out a will until really late in life. I found myself really irritated with the hospital she lived at, because part of the book talks about their plan for donations from Huguette. I understand wanting/needing donations, and targeting a very wealthy patient. Some of the doctors and at least one of her nurses accepted monetary gifts from Huguette and it seems like they did what they could to hide Huguette from inspectors, which kind of makes them suspect. And I’m not sure if it’s coincidence or what, but her room got moved when they learned they weren’t getting a large sum from her in her will. Also: her family challenging her will. I get their concern (especially in regards to her accountant) but it’s interesting that they’d challenge her will, given they hadn’t seen her in decades, and tried to get messages to Huguette, even though she didn’t seem interested in communicating with them. As of now, things still are not resolved. Empty Mansions is such an interesting and complex look at Huguette Clark, her life and her homes. I definitely recommend the book! Empty Mansions gets 4 stars.